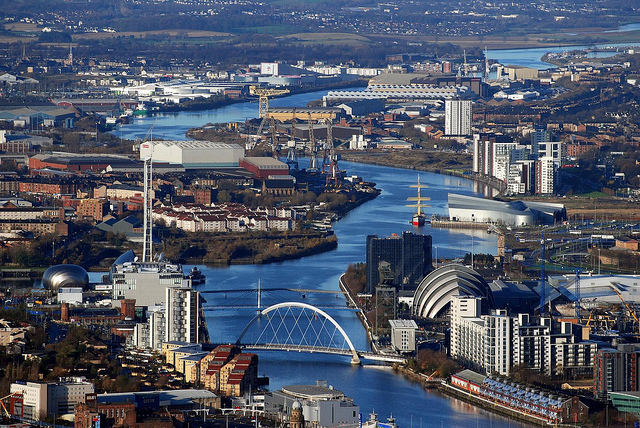 The Glasgow Commonwealth Games ended on Sunday, a very friendly games where Glasgow gave everyone a warm welcome. It was the first time England had won since 1986, and those games were also held in Scotland. In fact, it was a great Games for the British, with England, Scotland (fourth), and Wales (thirteenth) all winning more medals than they ever had before, in something of an Olympian afterglow. At the closing ceremony, the baton was passed on to Australia, because the next Commonwealth Games will be held on the Gold Coast in April 2018. Let’s hope we’ll have better uniforms for that. Oh and by the way – it poured with rain the last few days of the Glasgow Games, but our team was warm and dry in their jumpers and anoraks, so who’s laughing now? Now the Games are over for four more years, this is the end of our Scottish names. I picked the name Clyde because that was the mascot for the Glasgow Games, a cheery looking thistle named after the River Clyde, which flows through the city of Glasgow. As an Australian reference, I picked Campbell for the Campbell sisters, Cate and Bronte, who did so well in the swimming. Between them they won five gold medals, so as many as Wales, and if they were a country they would have come fourteenth in the medal tally. They were also on the team which set a world record for the women’s freestyle relay. Clyde is a Scottish surname, given to those who lived along the River Clyde. The Clyde is the third largest river in Scotland, and has its source in the Lowther Hills, in Scotland’s Southern Uplands. It meanders west across the country, and empties into the Firth of Clyde, the largest and deepest coastal waters of the British Isles. The river’s Gaelic name is Chluaidh, which probably means “cleansing”. It may be related to the Latin cloaca, “sewer, drain”. Clyde has been used as a first name for boys since around the 18th century. One of my favourite Australian Clydes is Clyde Fenton, a flying doctor in the years before WW II, who piloted his own plane as well as serving as a medical officer in the Northern Territory. Known for his kind and determinedly helpful nature, as well as his great resilience, he was famous for his daring rescues, lively escapades, and madcap pranks, which usually got him into trouble with the authorities. Although fairly indifferent to his own personal safety, he surprisingly lived into his eighties. The name Clyde was #104 in the 1900s, when Clyde Fenton was born, and peaked in the 1910s at #96. It left the Top 100 in the 1920s, and hasn’t charted since the 1950s. Although it’s a dated name, it has never been really popular, and perhaps isn’t as tied to a particular era as you might think. Interestingly, this name just reached the Top 1000 again in the US, so seems to be having a comeback there. The name sounds big and capable to me – perhaps because of Clydesdale horses. These Scottish horses were so important in colonial Australia they were called “the breed that built Australia”. Campbell is a Scottish surname. The Clan Campbell are one of the largest of the Highlands clans, and became one of the most powerful families in Scotland. The Campbells had a reputation for being good soldiers and fighters, but lacking in diplomacy and cunning. The chief of the clan is the Duke of Argyll, in the Peerage of Scotland. The current Duke is Torquil Campbell, and his son and heir is Archibald Campbell, who is around ten years old – I think you will remember that Archibald is a traditional name in the Campbell family. The name Campbell comes from Cam Beul, a Gaelic nickname meaning “crooked mouth, wry mouth”. The first person given this nickname is said to have been Dugald on Lochawe in the 12th century, who supposedly had a habit of talking out of one side of his mouth. The name was originally Cambel, but as early as the 14th century it began to be spelled with a p, perhaps because the Norman knights at the Scottish court who were responsible for administration misunderstood it as from the Norman-French camp bello, “beautiful plain”. Campbell has been used as a (mostly male) first name since the 17th century. Campbell began charting in the 1960s, debuting at #302. This is the decade British speed enthusiast Donald Campbell made several attempts in Australia to break land and water speed records, finally achieving success in 1964, when he broke both the land speed record on Lake Eyre in South Australia, and the water speed record on Lake Dumbleyung in Western Australia. The popularity of the name Campbell went up steeply in the 1990s, the decade when sound-alike Cameron reached its height and began falling, and peaked in the early 2000s at #181. In New South Wales it seems to be somewhere in the 300s, but in Victoria it is around the high 100s. In the past, it has managed to be a Top 100 name in Tasmania. It would be interesting to see how Queensland premier Campbell Newman affects the popularity of the name, since politicians generally don’t give names a boost, and Campbell Newman is extremely unpopular, according to the polls. In fact, it will be interesting to see whether he is still premier at the next Commonwealth Games. I do see Campbell quite frequently in birth notices, but not in Queensland, I must admit. Campbell is a strong, handsome Scottish choice which has managed to become a modern classic without ever becoming popular. This makes it a desirable option for parents seeking a name that is familiar without being common. Two Scottish surnames-as-first-names – but which one is better? Clyde received an approval rating of 41%, while Campbell did rather better at 59%.